Definition: Chilblains (CHILL-blayns) are small, itchy swellings on the skin that occur as a reaction to cold temperatures. It also is known as perniones (sing. pernio), chill burns and perniosis. Chilblains can be uncomfortable but rarely cause any permanent damage. They normally heal within a few weeks if further exposure to the cold is avoided. Chilblains are often confused with frostbite and trench foot. Damage to capillary beds in the skin causes redness, itching, inflammation, and sometimes blisters. It can be reduced by keeping the feet and hands warm in cold weather and avoiding extreme temperature changes. 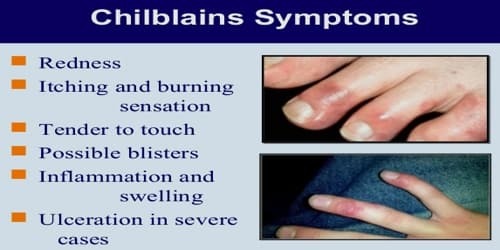 Chilblains can be idiopathic (spontaneous and unrelated to another disease), but may also be a manifestation of another serious medical condition that must be investigated. Treatment involves protecting yourself from the cold and using lotions to ease the symptoms. Chilblains don’t usually result in permanent injury. But the condition can lead to infection, which may cause severe damage if left untreated. Here are some key points about chilblains. The best approach to chilblains is to avoid developing them by limiting our exposure to cold, dressing warmly and covering exposed skin. 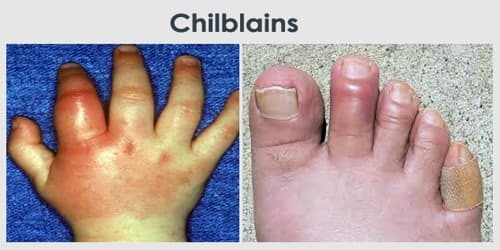 Causes, Sign, and Symptom of Chilblains: No one knows exactly what causes chilblains. Chilblains are caused by an abnormal skin reaction to cold. They tend to occur on ‘extremities’ that easily become cold – that is, our toes, fingers, nose, and earlobes. However, other areas of skin sometimes develop chilblains when they become cold. Rewarming of cold skin can cause small blood vessels under the skin to expand more quickly than nearby larger blood vessels can handle. This results in a bottleneck effect and the blood leaking into nearby tissues. Chilblains can also occur on areas of the feet exposed to pressure, such as a bunion or a toe that’s squeezed by tight shoes. 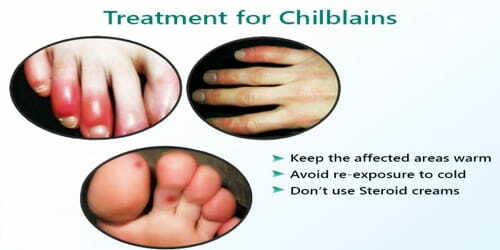 Treatment and Prevention of Chilblains: Diagnosing chilblains is straightforward. If symptoms are present and the patient has been exposed to cold, a doctor will diagnose chilblains. The doctor will want to rule out other conditions such as lupus, Raynaud’s phenomenon, erythromelalgia, and ischemia. If the diagnosis is in doubt, in rare cases, a skin biopsy may be taken. A course of vitamin B, especially nicotinic acid, helps improve circulation and may completely treat the chilblains. Nifedipine, a vasodilator, may help in more severe or recurrent cases. Vasodilation helps reduce pain, facilitate healing and prevent recurrences. It is typically available in an oral pill but can be compounded into a topical formula. Apply a mixture of friar’s balsam and a weak iodine solution. Avoid restricting the affected area. Avoid rapid changes in temperature (including from cold to hot). Wear warm shoes, socks, and gloves. If people’s skin is exposed to cold, it’s helpful to rewarm it gradually because sudden rewarming of the cold skin may worsen chilblains.